This post was submitted by a guest blogger. Princeton and its surrounding communities are at a turning point and need to make critical decisions about how they want to grow. The affordable housing obligations now being determined will very likely require much more development, and there is a pressing housing shortage. Moreover, there is a retail and suburban office space apocalypse upon us. Do they want to continue encouraging business as usual auto-dependent sprawl? Or do they want to make strategically guided equitable smart growth development on public transit and create walkable sustainable lifestyles that people are seeking? Furthermore, we need to act on climate change. Approximately 47% of our carbon emissions are from transportation, and not having or driving a car is the most important thing one can do to reduce their carbon footprint — apart from not having children… If we could provide green abundant housing for people who work and study in Princeton or commute elsewhere by public transit, we have the potential to prevent and reduce tons of carbon (pun intended) and create more convenient healthier lifestyles for people. Currently, approximately 23,000 people commute to Princeton by car from out of town every day. This commuting creates large volumes of traffic and congestion in our town and region. What if we could house the majority of those people in and near Princeton? On public transit. It is possible and it should be done. This vision imagines a Princeton metro region that consists of dense walkable clusters in and around Princeton that would be well connected by public transportation. Where people could essentially live, work and play effortlessly without having to use a car. It presents fifteen ideas that articulate the overall vision. Each idea could happen independently and whenever but pretty much all depend on public transit infrastructure. And for the most part, each idea can happen in different ways — that’s the fun part. It also should be mentioned that these are all not original ideas, people have been working on some of these concepts for many years and many of this ideas are mentioned in the 2010 NJDOT Route 1 Smart Growth Study. This vision simply tries to put them all in one place and elaborate specifically on the Princeton region. This is not an official plan — just a local urban planner’s perspective. There obviously are larger implications to these proposals such as the impact on local traffic, schools, and ratables — but if done right it could actually reduce congestion, enrich our school systems and be profitable to municipalities. This proposal could create thousands of new walkable, transit-connected housing units, new commercial retail, restaurants, cafes and office space, billions of dollars in economic growth and thousands of new jobs. It can be done and should be done. Redevelop Thanet Circle and turn the Shopping Center area into dense mixed-use town center – There are already plans to develop the undeveloped site north of the Shopping Center into senior housing. Though, just north of that site across Terhune is an office complex at Thanet Circle. This office complex is super suburban with lots of surface parking and lawn space. It could and should be completely redeveloped into a well designed dense residential community next to the shopping center that could support public transit and thriving businesses. The Shopping Center should also be expanded to include housing and office space. Several stories should be built on top of the existing structure and portions of the parking area should be developed. A parking deck should also be built to accommodate the potential loss of parking space and more activity. Develop the Butler Tract – We all know this is eventually going to happen. The university should just do it. And it should be fairly dense. This property alone could provide a substantial amount of university and affordable housing. Convert the Dinky into a light rail, extend it to Nassau Street and create stops along the way to Princeton Junction – This idea has been proposed before and is critical to getting more people to use public transportation and creating truly smart growth transit-oriented development in Princeton and West Windsor. It made no sense to push the Dinky further away from town, but it can be fixed. The old Dinky train car should be replaced with a modern light rail system, be extended to Nassau Street along the parking side of University Place and stops should be created along the line all the way to Princeton Junction. This new light rail system would support all new development along the line and the development would support the train line making it more profitable for NJ Transit (which it currently isn’t) or Princeton University should take over ownership (they certainly have the money). Currently, the University is building a Maya Lin art installation in the way of the possible extension path. This installation should not be built in a way to block the light rail extension. Develop University Lots 16-23, Redevelop Lower Alexander Street and add a light rail stop – University Lots 16-23 are massive parking lots in a prime location. A parking deck should be built and the sites should be developed for university housing. Also all along lower Alexander, there are suburban-style service office buildings. Mixed-use buildings with primarily housing and possibly a new elementary school should be built all along the corridor. There is already high density of people living in this lower portion of Alexander at the Lawrence and Lakeside Apartments, if there was a transit stop located in the Lower Alexander area, it would make life so much easier for the people already living there to quickly access downtown Princeton, the region or the Northeast Corridor. The golf course should also become public open space. Imagine the largest new public park in town! Create the Route 1 Bus Rapid Transit line – Bus Rapid Transit (BRT) is an increasingly popular form of public transportation that gives buses a dedicated lane with formal stops along the way essentially making a train line that is a bus. This idea is proposed in the 2010 NJDOT Route 1 Smart Growth Study and should happen. The third outer lane on each side of Route 1 should be dedicated to the BRT. It would not only make some clusters mentioned in this vision possible but also open up a huge amount of other redevelopment opportunities further along Route 1 in both directions. This BRT should first be piloted between Quakerbridge mall and Forrestal Village and then eventually expand to Trenton and North Brunswick Town Center. BRT stops would ideally be located where there is a safe way to cross the highway. Proper pedestrian amenities should be added to crossings. Where there is an overpass, stairs and elevators can bring people up. In some cases, large cloverleaf off/on ramps may need to be adjusted to better suit pick up and drop off. One of the most critical stops for the BRT would be where it intersects with the Princeton light rail. There should be a convenient way to transfer there. 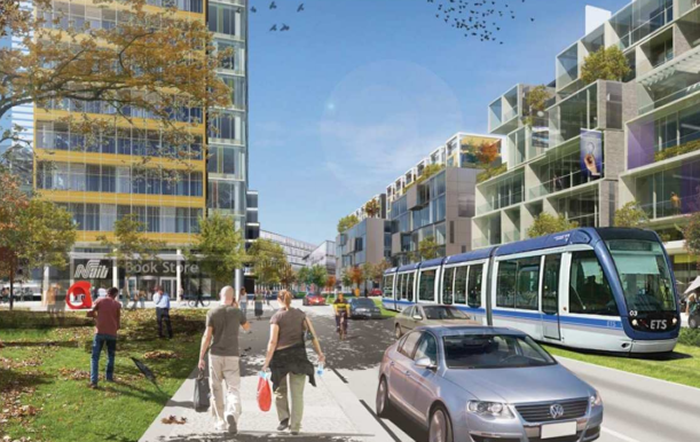 Add light rail and Bus Rapid Transit (BRT) stops by Canal Pointe and develop the surrounding land – This is probably not very popular among environmentalists because it’s undeveloped land, but makes a lot of sense from a smart growth perspective. Many people who work in Princeton and New York City already live at Canal Pointe and this would make access to both locations much easier and reduce automobile dependence. It would also give access to everything on the Route 1 Corridor through the proposed BRT line. The area on both sides of the tracks combined, as well as along Canal Pointe Boulevard, is a massive amount of land that could also fulfill much of the housing needs for Princeton University and West Windsor and allow people to conveniently access Princeton and the Northeast Corridor using public transportation. There should also be a K-12 school built near the light rail station that would be for all the new transit connected units in the area. Add a light rail and BRT stop and redevelop the Alexander Road Corporate Offices – Similarly, adding BRT and light rails stops and redeveloping the Alexander Road Corporate Offices and the North Carnegie Campus would provide public transportation access for all the corporate offices and provide space to redevelop the sites along the rail line into a massive mixed-use commuter village. The light rail stop on Route 1 is extremely critical to the BRT concept because it would allow people to transfer from the BRT to the light rail. Add BRT stops and develop a portion of West Windsor Fields and SRI International – These sites are very close to the proposed light rail line and if there was BRT line it could make living and taking public transportation to Princeton or the Northeast Corridor fairly easy. The West Windsor field is currently undeveloped and the SRI site is a suburban-style office building with lots of lawn that if closed will be a major blight on the area. Both sites should be developed/redeveloped into dense housing with higher concentrations near the BRT stops. Add BRT stops and redevelop Windsor Green, Market Fair, West Windsor Plaza and the South Carnegie Center Campus into a dense walkable new urbanist development – While much of this would depend on the BRT stations and shuttle buses, this whole area that consists of suburban stores and corporate offices could be redeveloped into dense walkable new urban development. Some of this area is also close to the proposed light rail and could be redeveloped without the BRT stops. Build the Princeton Junction Transit Village – There were plans to develop the area around the Princeton Junction train station into a Transit Oriented Development Village, though they were stopped due to the recession and resident backlash. This idea should be revisited and completed. This is probably one of the most logical things to do from a smart growth perspective and can be done without any of the proposed transportation infrastructure. Based on the previous design it would provide 800 housing units, 1.5 million square feet of office and 500,000 square feet of retail space. Add residential and BRT stops to Forrestal Village and develop the surrounding area – One of the main reasons Forrestal Village did not succeed as a town center was because they didn’t have people living there to give it life. It was designed as a town but it just consisted of commercial uses. How could they complete with strip malls and big-box stores that have massive amounts of space and signs in your face. Forrestal Village needs to have residential units — and lots of them — to become a real village/town. There should also be institutional uses such as a school and library. Spaces in the existing structures should be converted to residential and all the parking area should be developed to have residential units or parking decks. In addition, the Sandoz Corporate office site should be redeveloped to housing and dare I say perhaps even portions of the adjacent Princeton Nursery Land and the sites across Route 1 such the Robert Wood Johnson Foundation, and the Princeton Forrestal Campus. Furthermore, there should be a BRT stop to access the light rail line and Route 1 corridor as well as a shuttle bus that loops every half hour from Forrestal Village to the train station and downtown Princeton. Densify Plainsboro Town Center – There were plans to redevelop the strip mall across from the Plainsboro Town Center to more mixed-use, but the owner decided to keep the struggling strip mall a struggling strip mall. That portion needs to be redeveloped into a dense residential community and the existing Town Center needs to be densified in order to have a thriving downtown. There should also be a shuttle that goes to and from the Princeton Junction Station. Add BRT stops and a train station and redevelop the Wyeth Tract/Former American Cyanamid Site and surrounding area – New BRT stops and a train station should be added at the Wyeth Tract/Former American Cyanamid site and the surrounding area should be redeveloped into one the largest walkable sustainable transit-oriented new urbanist community in the country. The development should essentially be a self-contained downtown with retail, offices, housing, a K-12 school for local residents, recreational uses on a train station with bus connections to the surrounding communities. Residents should never need a car. Over time the Quakerbridge Mall and other strip mall sites should be redeveloped into walkable new urbanist development as well. A portion of this is already planned (Howard Hughes West Windsor), and a variation of this proposal should be eventually be approved. Though the design should better oriented toward future public transit. Redevelop Wall Street, Princeton North Shopping Center, Montgomery Shopping Center into a Town Center – Three and a half miles north of downtown Princeton is the proposed Montgomery Promenade, Princeton Airport, Wall Street Office Complex, Princeton North Shopping Center, and Montgomery Shopping Center as well as a hodgepodge of other office buildings and auto-dependent strip malls. This whole area should be redeveloped into a large mixed-use town center. There really is enough space to create a wonderful dense walking town in what is now strip-mallville. And the 605 bus line should be rerouted to go directly to downtown Princeton which only would take 10 minutes. (Currently, it does this zigzag that takes forever to get to downtown Princeton). Moreover, the Princeton Airport should begin flying to other airports, allowing the region’s residents to fly in and out of the local area and be able to get around on public transit. Create an actual Town Center on and around Franklin Towne Center – While it may seem like this site is a little out of the way, it’s actually only a 20-minute bus ride on the Coach Suburban bus that goes from Princeton to New York City and has the potential to be a great town center. Currently, it is a struggling strip mall surrounded by thousands of townhomes and apartments. The current anchor just closed its doors several months ago and many of the stores sit vacant. These sites could be redeveloped into a well design mixed-use town center with a new school and thousands of residents surrounding it within walking distance. That’s it for now. Of course, it goes without saying, all this new development should be well designed green buildings and incorporate green infrastructure to mitigate stormwater runoff. As well a provide abundant public and open space. If you are a resident, community group, planning board or council member in one of the towns mentioned and care about smart growth, climate change and sustainability, advocate for these projects. Lobby at the state level for transportation funding. Elect politicians that care about smart growth. Work with a Planning & Urban Design professional to develop conceptual site plans for these areas, get community buy-in, work with your planning board to amend your master plan for the areas, work with your council to amend the zoning and get developers to develop these sites. This entry was posted in planning, Princeton, Smart Growth, Sustainability, Transit and tagged mercer county, New Jersey, planning, Princeton, smart growth, Transit. Bookmark the permalink.